It was a performance befitting of a moody teenager. 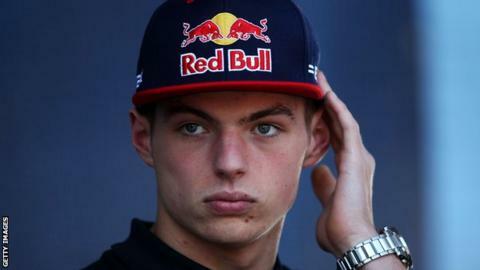 But, with 20 grand prix starts to his name, it can be easy to forget that 18-year-old Max Verstappen is still exactly that - a teenager. We've not seen much of the Toro Rosso driver's moody side, but it was on full, potty-mouthed display in the Australian GP on Sunday. There was even the teenage trademark of a slammed bedroom door (it was actually the office door of team principal Franz Tost), just to complete the histrionics. Having started fifth on the grid, the Dutchman was sixth midway through the race when he turned into mad Max. "I wanted to pit first," he grumbled down the radio after his team-mate Carlos Sainz went into the garage for new tyres. Eventually, Verstappen was given a new set of tyres and re-emerged in 10th, a place behind Sainz. That's when the strop hit its stride. "Can I try to get past? Let me drive, this takes too long." "Come on we have to do something!" The pair proceeded to pass Renault's Joylon Palmer at consecutive corners, before Verstappen's impatience almost got the better of him. With three laps to go, Verstappen clipped the back of his team-mate and went into a spin. He recovered to finish 10th, but it could have been oh-so costly for a team that looks like it could lay claim to being the best of the rest behind Mercedes and Ferrari, with Verstappen and Sainz having qualified fifth and seventh respectively on Saturday. It's anyone's guess what was said behind Tost's slammed door in the Toro Rosso debrief. In front of the microphones Verstappen, who refused a team order to let Sainz past at Singapore last year, made his thoughts clear. "It was a very disappointing race. The start was great. But from there onwards it turned into a nightmare really," he said. "There was miscommunication for the second stop and at the end we chose the wrong tyres for the last stint." From Sainz's point of view, there was not an issue. "I think it was a nice battle. I have no issues at all with what happened. I don't know why there is something to be angry about," said the 21-year-old Spaniard. And Tost explained why Sainz was allowed to pit before Verstappen: "Carlos had a lot of front locking. Therefore we called him for an early pit stop. "Within the next three laps also Max came into the pits, but the team was not prepared for this stop, as we did not call him. Therefore he lost seven seconds." Verstappen was praised for his overtaking ability and willingness to race in his debut campaign last season, when he finished 12th in the drivers' championship. But social media users were quick to poke fun at his teenage sulk. Did anyone find Verstappen's dummy on the Melbourne track? Could Verstappen reprise Harry Enfield's classic comedy character of Kevin, the quintessential moody teenager? BBC Radio 5 live reporter Tom Clarkson said Verstappen lost his cool. "There is no doubt Max Verstappen has got hot under the collar in this race," he said. "This is the first time we have seen over-exuberance from him and frustration in his driving." And fans using the #bbcf1 hashtag on social media were less than impressed with the Toro Rosso man's manner. Garrick Chandler: "Max is childish and I am sick of the whinging. Turn his radio off." Robert Leon Felix: "So, Verstappen is sounding more and more self-centred and arrogant." Garry Holett: "If Max spent a little less time acting the spoilt child and more on looking for gaps, he wouldn't need people to let him past!" Jonathan Evans: "Verstappen is only a kid but boy doesn't it show. Needs to be taken down a peg or two." Rhyan Paul: "Someone get Max V a pacifier, petulant child! Time on the naughty step for you after the race!" But there were words in defence of Verstappen, with one contributor comparing him to seven-time world champion Michael Schumacher. Only Me! : "Max reminds me of a young Shui. Get off his back!" David NicholsonHirst: "Max Verstappen is a different animal, great to watch this guy. Lewis watch out!" quixoticgeek: "Oi, give Vestappen a break. You lot attacking him, were you any better at his age?"